Two of the first, if not the first, motor-buses involving a regular service in the UK was instituted, in London, by the Motor Traction Company, which, like many other companies of the era, considered and experimented with steam buses as an alternative to the then ubiquitous horse-drawn bus (and tram). The company was formed as the London Steam Omnibus Co Ltd, but rapidly metamorphosed into one interested in operating motor-buses, as no suitable steam buses were available. A prototype Daimler petrol bus was built in Bristol by Brazil, Holborough & Straker, thought to have been designed by Sydney Straker, of Straker-Squires fame. As per the photo, the 26-seat white-painted body was of the horse-bus type, with wooden, spoked wheels, with steel rims. Two vehicles were built and both vehicles and routes approved by the Metropolitan Police Public Carriage Department. They started a service on 9th October 1899, between Kensington Gate and Victoria Station, some 3 miles. Later, as evidenced by the photo, the route was changed to run from Kensington Gate to Oxford Circus, nearly 4 miles. Sadly, the patronage was poor, the service ceasing in December 1900, wholly in the 19th century, as the Victorians would aver! 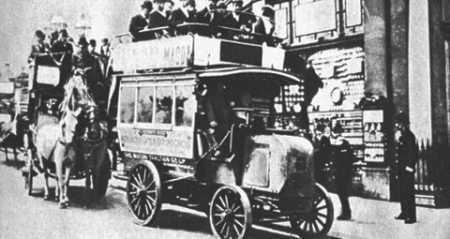 It is not known why, in itself, this service was unsuccessful for, by 1903, the Met had approved applications for 61 mechanically-propelled buses to ply the London streets. It took until 1905 for London General (LGOC) to buy its first motor-buses; from Straker-Squire! Chris thanks for a really interesting piece of motor bus history I had not heard of the bodybuilder just Straker of course. Luckily someone had the foresight to snap the bus before its demise! these snippets of odd firms help our knowledge of the wider scene. This photo demonstrates a point which has always fascinated me with photos of buses (horse or mechanical) from this era – they all seem to look very dangerously top heavy. I’m not aware that they had a reputation for toppling over, but they all give the appearance that the slightest corner would have them on their side. I suppose that the mechanicals would have lowered the centre of gravity on motor buses, but horse buses would’ve been top-heavy I’d’ve thought, especially if there were more passengers ‘outside’ rather than inside.